In its brief history, Charleston rose from the Arizona desert floor to become one of the most notorious, and memorable locations in the American West. Though it would soon begin its decline returning back to the dusty Arizona landscape from which it arose, there remains its crumbling adobe walls, and scarce eye witness accounts from those who witnessed it. Some of those accounts are reprinted below so that the reader can enjoy reading the actual words of those who saw it with their own eyes. In particular, those who recalled the now famous Clanton brothers and their father are featured below. The common thread between these accounts is that they are in the context of remembering the Clantons at Charleston. Wm. N. Miller was recalling his times in Tombstone and Charleston, and his account also illustrates how often these boomers, as they traveled from one western boomtown to the other, would see each other again, and in like trades, such as mining and its related transportation. Included in those he recalled years later where the Clanton brothers. In 1939, Edith Dorsey also recalled the Clanton’s, but from the perspective of a child whose mother was troubled by them and concerned for their safety while they were visiting Charleston. She wrote two letters to Mrs. Macia of Tombstone, who was a key preserver of Tombstone history, as are her descendants today as owners of the Rose Tree Museum in Tombstone. Edith’s recollection of the Clanton’s illustrates that the code of the American West forbade men, regardless of their station or status in life, to scare woman and children. Phin Clanton, Ike and Billy’s brother, would offer service as a circumstantial witness in a Charleston murder mystery. Clanton didn’t witness the crime, but he observed some of the area in which the crime had taken place. Suspicion was cast on Charleston neck breaker Jerry Barton, and it wasn’t the first time that his name had surfaced with violence in the boom town on the San Pedro River. 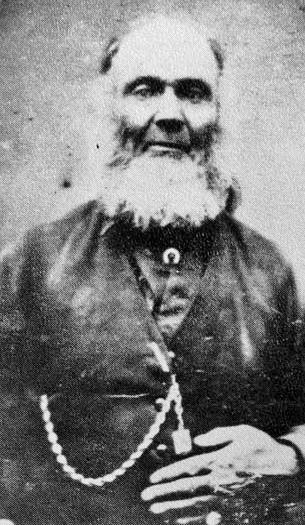 William Somers died as a result of what were thought to be benign causes, possibly injuries from an accidental fall. But a number of Charleston residents contacted the Epitaph in Tombstone with their suspicions that Somers might have been a victim of foul play. The location of his body and money missing from his person when his pockets were searched only added to the intrigue. Barton testified about the time he spent with Somers in the last minutes of his life. “I know, or did know, William Somers. Saw him last about half past 9 o’clock, about ten yards from my house. He hallooed at me and asked when the train was coming. I recognized him and told him to come around the pond that was between us, and go home. I brought him around the pond and started on the trail towards the bridge. If Somers had walked off into the night as Barton had described, then one set of foot tracks, those of Somers, would have been found. This set of foot tracks would have constituted the route of his final steps before accidently falling to his death. But S.W. Starrh and others soon noticed an anomaly. “…I got upon the bank with Phin Clanton, N. Price and Geo. Williams. We found tracks leading up to the edge of the bank, the last being one or two feet from the edge. There were also tracks leading away from the edge of the bank,” recalled Starrh. Mary Wood, the wife of mining executive S.W. Wood, recalled Charleston and the recreation that the Clanton would sometimes partake in. “Perhaps at night the street may have been livelier. The Clanton boys and their friends sometimes had horse races south of the town. Gamblers came down from Tombstone sometimes but were not welcomed by either cowboys or mill men. The latter were usually steady men with families or were bent on acquiring a ranch in California. The town was usually very quiet. Sam Aaron was the sometimes errant son of a local Charleston merchant. 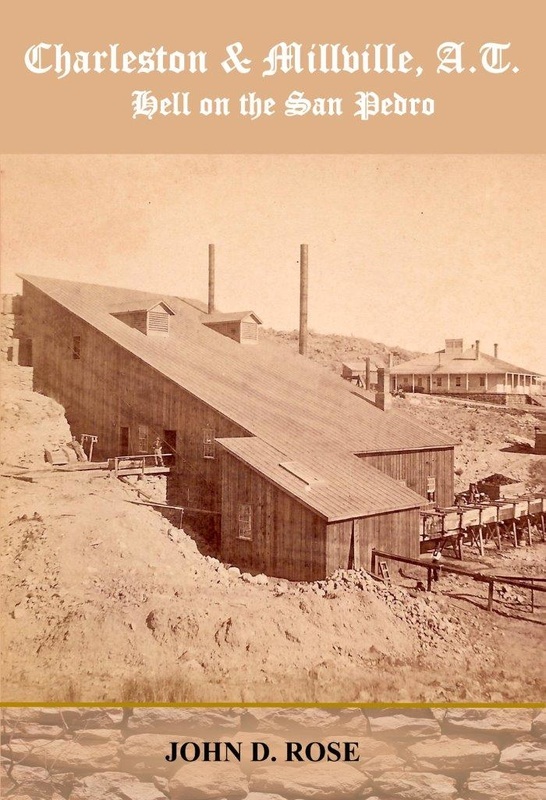 He once gambled some of his father’s funds away, and spent time working in a stamp mill across the river at Millville in order to make right the loss. He would also venture into the saloon world of Charleston, and his time in the area would also bring him into contact with Ike Clanton. Aaron recalled the near constant movement of stolen goods in the area, and the rustlers who profited handsomely from them. This made an inviting target for such criminals, with honest teamsters forced to live under the constant threat of robbery. “Many of these smuggling trains, when they had to be unloaded, were ambushed by rustlers. These rustlers were made up, for the greater part, of renegades who infested Arizona. Most of them came from Texas because they feared the Rangers. A good many of these rustlers were widely known…The Clantons…were the leaders of a gang of fifty. They lived in mud houses alongside the San Pedro River. Their escapades were many, but my connections with those men came about through the fact that they had placed confidence in me and would bring their money to me to hold and divide it up among them. Though such was not the case, this stems from Ike Clanton’s testimony during the Spicer hearing which followed in the wake of the Gunfight near the O.K. Corral. His strategy was to cast doubt upon the Earps with whom they were feuding, and at the same time draw attention away from questions regarding their own questionable activities. Given the racial climate at the time, it would have been easier for Sam to hold funds from the theft of Mexican cattle than it would have from stage robberies where Americans might have been shot at or killed. In other words, Sam may well have needed to believe that the Clantons were victims of the Earps before he would accept the money. Wyatt Earp would later testify that he had an early encounter with Billy Clanton at Charleston. 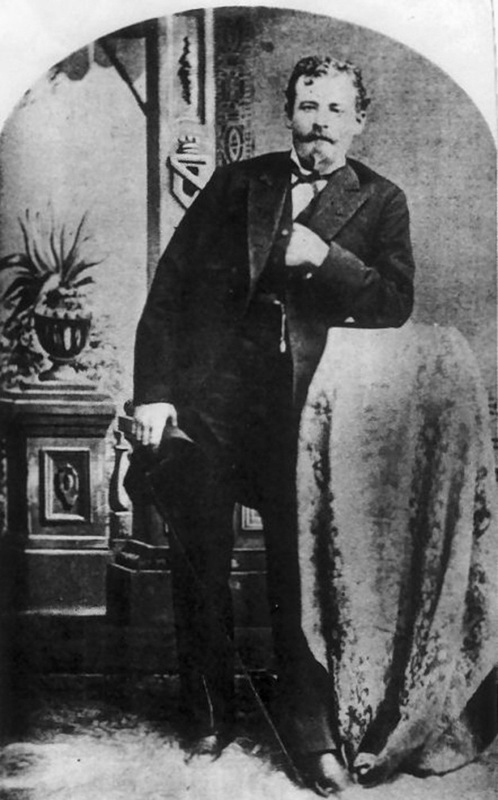 Earp told his account at the Spicer Hearing, as he and his brothers and Doc Holliday stood to answer for the shooting deaths of not only Billy Clanton, and also Frank and Tom McLaury. “The difficulty which resulted in the death of William Clanton and Frank McLaury originated last spring, and at a little over a year ago, I followed Tom and Frank McLaury and two other parties who had stolen six government mules from Camp Rucker. Myself, Virgil Earp, and Morgan Earp, and Marshall Williams, Captain Hurst and four soldiers; we traced those mules to McLaury’s ranch. Of an early, if not the earliest encounter between Wyatt Earp and his eventual shooting victim Billy Clanton, Wyatt testified to the following: “Myself and Doc Holliday happened to go to Charleston the night that Behan went down there to subpoena Ike Clanton. We went there for the purpose to get a horse that I had had stolen from me a few days after I came to Tombstone. I had heard several times that the Clantons had him. When I got there [Charleston] that night, I was told by a friend of mine that the man that carried the dispatch from Charleston to Ike Clanton’s ranch had rode my horse. At this time I did not know where Ike Clanton’s ranch was. “A short time afterwards I was in the Huachucas locating some water rights. I had started home to Tombstone. I had got within 12 or 15 miles of Charleston when I met a man named McMasters [McMasters would later join the Earp Vendetta posse]. He told me if I would hurry up, I would find my horse in Charleston. I drove into Charleston and saw my horse going through the streets toward the corral. I put up for the night in another corral. I went to [Justice Jim] Burnett’s office to get papers for the recovery of the horse. He was not at home having gone down to Sonora [Mexico] to some coal fields that had been discovered. I telegraphed to Tombstone to James Earp and told him to have papers made out and sent to me. He went to Judge Wallace and Mr. [Webster] Street. They made the papers out and sent them to Charleston by my youngest brother, Warren Earp, that night. “While I was waiting for the papers, Billy Clanton found out that I was in town and went and tried to take the horse out of the corral. I told him that he could not take him out, that it was my horse. After the papers came, he gave the horse up without the papers being served, and asked me if I had any more horses to lose. I told him I would keep them in the stable after this, and give him no chance to steal them.” According to Wyatt’s testimony, long before their famed confrontation in Tombstone, mistrust and animosity between the Earp and Clanton factions had begun at Charleston. Carrie Miles was recalling her time in Charleston and the path her family took to get there. It all started in the fall of 1879, when her father, William Douglass, relocated his family to the Arizona Territory. They left Los Angeles traveling by covered wagon, as news of Schieffelin’s discoveries caused a rush, and they were to be a part of it. 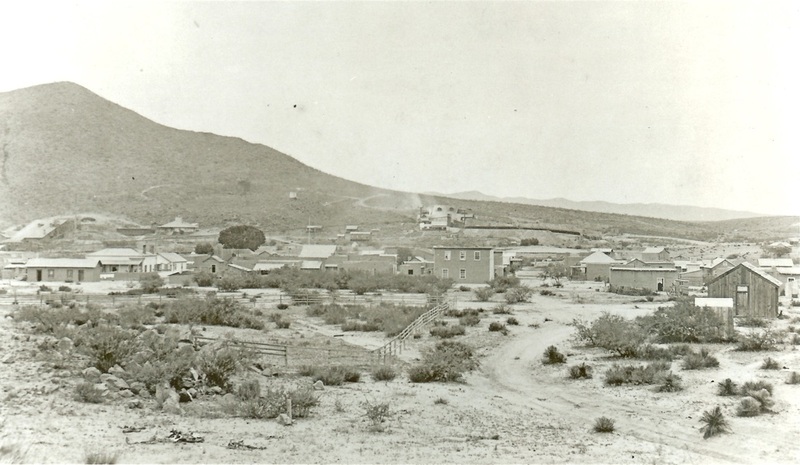 While looking through the corrals of Tucson, Carrie’s father met Alexander Miles, whom he hired to haul them and their belongings on the final leg of their journey to Tombstone. But the elder Douglass would choose Charleston instead. Miles decided to settle near the family in Charleston as well, having noticed Carrie Douglass, and the two soon began to court. 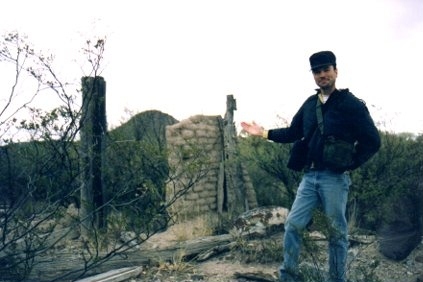 John Rose at a possible site of the Clanton Ranch. On November 27th, 1880, N.H. Clanton, Father of Clanton brothers, purchased lots 10 and 11 of block G, Pioneer Street in Charleston, which contained a saloon and residence of James Clark. Also included in the sale were “…all liquors and bar fixtures” as well as two lots on the opposite side of Pioneer street including a home that Clark had previously lived in as well. 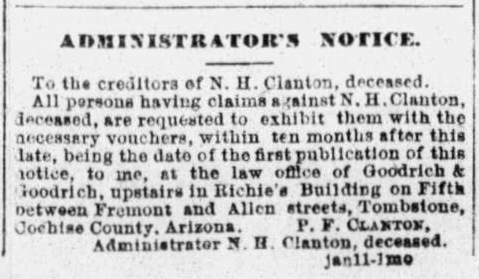 The transaction was not to be a smooth one, with seller James Clark suing N.H. Clanton to recover the property less than two weeks later, on December 3rd, 1880. Following this setback, Clanton would again try his hand at the Charleston real estate market, later purchasing another lot and home in Charleston on April 28th, 1881, less than four months before his death. The home was located on lot 6, block M at Charleston, with a twenty five foot frontage on Stowe Street, and a depth of one hundred feet. He purchased the home and land from Francisco A. and Lobia Garcia, for $100.00 cash in hand, and the transaction was witnessed by Jim Burnett. It is indeed ironic that both Wyatt and Virgil Earp owned homes on Block M in Tombstone and the elder Clanton purchased a home on block M of Charleston. Block M of Charleston has long since been consumed by the widening of the San Pedro River (see entry below), so this site is simply gone. This is a separate property than that of the Clanton Ranch, south of Charleston. 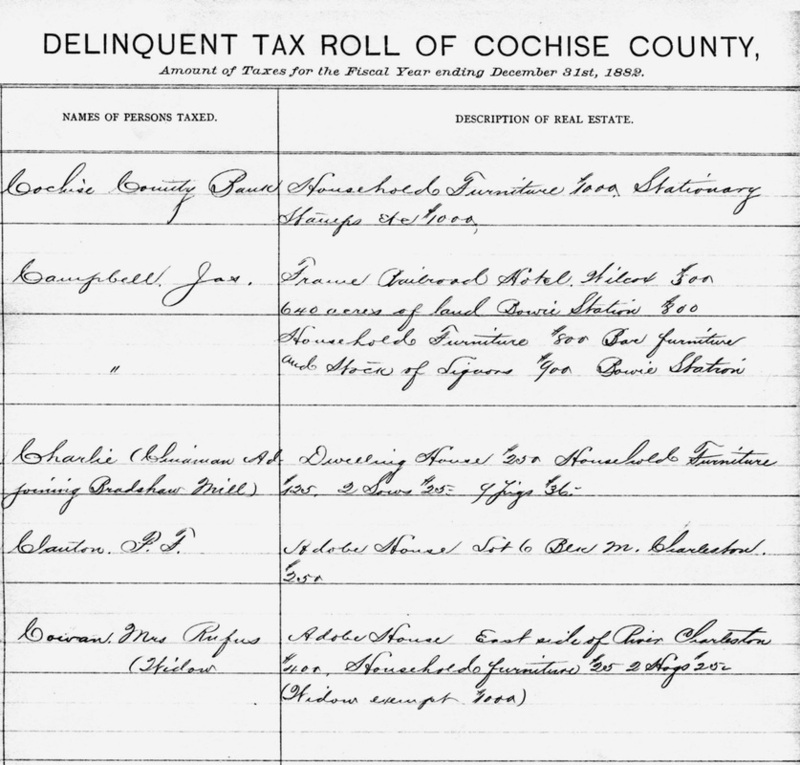 On the second entry from the bottom, Phineas “Phin” Clanton makes and unfortunate appearance in the 1882 Cochise County Delinquent role. This is courtesy of Kevin Pyles, Cochise County Archives, Bisbee Arizona. Phin Clanton has yet to pay taxes on the home formerly owned by his deceased father N.H. “Old Man” Clanton. Located on Block M, lot 6, the adobe home is valued at $250.00. Not surprisingly, Phin Clanton was listed as the taxpayer on his father’s former Charleston adobe house, as he was the administrator of his estate. Tombstone Daily Nugget, January 14th 1882. Near the bottom left of the Charleston plat map below, block M is visible where the elder Clanton, owned lot 6. The above information is in part excerpted from “Charleston & Millville A.T. Hell on the San Pedro, by John D. Rose. This is the first and only book ever published on Charleston, released in 2012. For more on this remarkable story and far other research breakthroughs, this book is available at https://www.createspace.com/3758160. Also available at Amazon.com.